In this article a fractional order controller is presented to improve the response of the event based PID controller. First a conventional PID controller is tuned using MATLAB tuner software. Then a fractional order PID is tuned using genetic algorithm. According to simulations by combining the event based technique and fractional order controller, a noticeable improvement in system response can be seen. Besides, reduction in control input updating is very helpful in cutting the communication bandwidth waste. The majority of the work and research in automatic Control considers periodic or time-triggered control Systems where continuous time signals are represented by their sampled values at equi-distant sampling intervals . Modern distributed control systems also impose system architectural constraints that make it difﬁcult to stick to the time-triggered paradigm. This is specially the case when control loops are closed over computer networks or buses . Another reason why event-based control is interesting is that it closer in nature to the way a human behaves as a controller. The human motion control system is event-or pulse-based rather than time-triggered. Also, when a human performs manual control his behavior is event-based rather than time-triggered. It is not until the measurement signal has deviated sufﬁciently enough from the desired set point that a new control action is taken . The ﬁnal reason why event-based control is of interest is resource utilization. An embedded controller is typically implemented using a real-time operating system that supports concurrent programming. The Available CPU time is shared between the tasks in such a way that it appears as if each task is running independently. Occupying the CPU resource for performing control calculations when nothing signiﬁcant has happened in the process is clearly an unnecessary waste of resources. The same argument also applies to communication resources. The available communication bandwidth in a distributed system is limited. To use this for sending data in a time-triggered fashion is clearly a waste of bandwidth . Fractional order technique was developed during the last few decades and it has various practical applications. Flexible spacecraft attitude control, car suspension control, temperature control, motor control etc. This idea of the fractional calculus application to control theory has been described in many other works and its advantages are proved as well . In this article first a conventional PID controller is used to event based control of first order plant. Then, a fractional order PID is tuned using genetic algorithm. This controller has less rise time and overshoot. Selection of λ, δ gives the classical controllers. PD controller (λ =0), PI controller (δ =0) and PID controller (λ, δ=1). All the above-mentioned controllers are special case of the fractional controller. 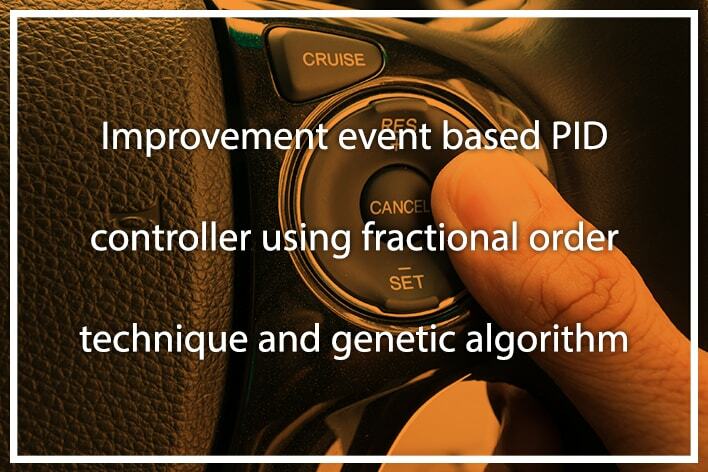 Some advantages of P controller include better control of dynamical systems; (they are described by fractional-order mathematical models), and that they are less sensitive to parameter variations of a controlled plant. In the above equation is the error vector size. Genetic Algorithm (GA) is a stochastic global search method that mimics the process of natural evolution. The algorithm starts with no knowledge of the correct solution and depends entirely on responses from its environment and evolution operators to arrive at the best solution. By starting at several independent points and searching in parallel, the algorithm avoids local minima and converges to sub optimal solutions. In this way, GA has been shown to be capable of locating high performance areas in complex domains without experiencing the difficulties associated with high dimensional. First, PID and FOPID coefficients should be obtained. These coefficients are shown in Table 1. Introduced plant output is shown in Figure 1. A step disturbance also is applied about 5s. As shown in this figure, FOPID has less overshoot and rise time in transient time and in dealing with disturbance. As mentioned previously event based controller reduces the communication in the networks. In present system, communication state between control unit and event detector unit is shown in Figure 2. According to this figure control input is updated during transient time and disturbance appearance. Maximum admissible error is 0.1 here. In this article performance of event based PID controller was improved by using fractional order technique. This type of controller is more flexible for its degree of freedom. A FOPID has 5 degree of freedom which is 2 more than conventional PID. FOPID controller coefficient were obtained by using genetic algorithm. 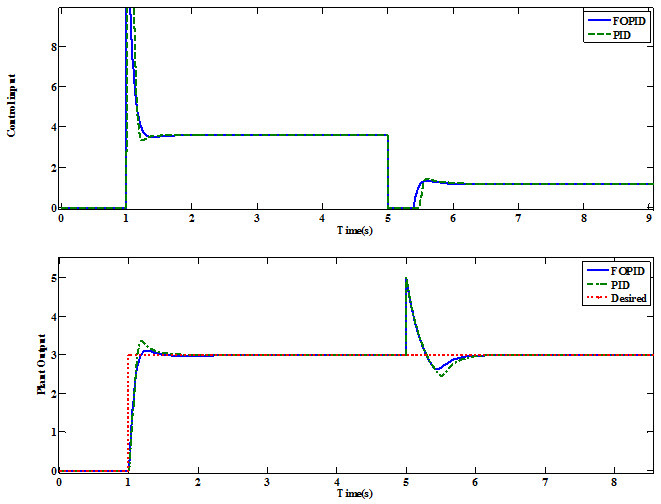 Simulation showed that fractional order PID has better response, and it is also more robust against disturbance. According to results, proposed event based FOPID not only can reduce sufficiently the communication between sensor and control unit, but also it can create better response than conventional PID controller. Karl, A., (1999). A simple event-based pid controller. IFAC World congress. Muhs, D. et al. (2003). Roloff/Matek mechanical parts, 16th ed. Wiesbaden: Vieweg Verlag,. 791 p. (In German). ISBN 3-528-07028-5. ISO/DIS 16000-6.2 (2002) Indoor Air – Part 6: Determination of Volatile Organic Compounds in Indoor and Chamber Air by Active Sampling on TENAX TA Sorbent, Thermal Desorption and Gas Chromatography using MSD/FID. Geneva, International Organization for Standardization. Goon, B. (2005). Effects of excessive drinking on sport participation. Retrieved on 7. 8. 2006, from http://www.excessive_ drinking.com.